The Engineered Process Solutions group (EPS) at Cummins-Wagner fabricates custom packaged skids, which have seen unprecedented growth within the last few years. 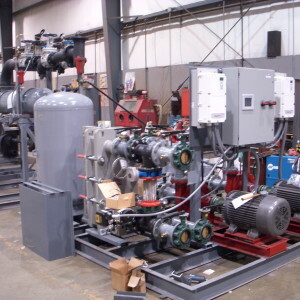 Cummins-Wagner, a distributor of name-brand heat transfer equipment, air compressors, and pumps, supplies these custom packaged skids to their five eastern territories. The success of the EPS group is due in part to acquisitions in New York and Florida (Siewert Equipment in 2008 and Food Equipment & Engineering in 2010), but also it’s commitment to customer service. Cummins-Wagner’s EPS group creates custom packaged skids to further help their customers. Fifty-five years ago, Cummins-Wagner offered a single product and relied solely on outstanding customer service to remain in existence. Since then, it has grown exponentially over time, servicing name-brand pumps such as Bell & Gossett, Gorman-Rupp, and Liberty (among many others). Today, the Engineered Process Solutions Group, a division within Cummins-Wagner, expands C-W’s product line by offering custom packaged skids based on individual needs. Tuvesson and his team oversee the design of the mechanical and electrical components of the custom packaged skids. They supervise the mechanical design and layout as well as the control panel design, which includes the human machine interface (HMI) and Program Logic Control (PLC) if required. The EPS group conducts the process from start to finish, including 3-D drafting, instrumentation selection, and fabrication of the new project, creating a 100% original Cummins-Wagner package. Cummins-Wagner’s customized packaged solutions contain two unique advantages. First, they eliminate the need for equipment that can be built only onsite. When customers purchase new equipment from CW, they don’t need to hire multiple personnel – no mechanics to manufacture the equipment or electricians to install the control panel. Cummins-Wagner provides a single source company that takes ownership of the entire design, manufacturing, and start-up process. Second, the EPS Group can provide services that are not typically available with standard products. They offer expedited delivery, space sensitive designs, and customer-specific brands. When a customer needs the equipment delivered quickly, CW offers rapid turn-around no matter how detailed the specifications. The EPS group can also design the equipment to be disassembled into smaller pieces, allowing the customer to reassemble the product elsewhere. Some customers prefer various equipment pieces to come from certain brands; if the preferred brand is not within CW’s line cards, the EPS Group can provide almost any name-brand product, so the customer doesn’t have to order from multiple sources. Cummins-Wagner continues to build on its original foundation of highly involved customer service. Offering support, recommendations, time, and commitment, CW wants all customers to be completely satisfied with their custom packaged skid. Request a free quote for any packaged system!